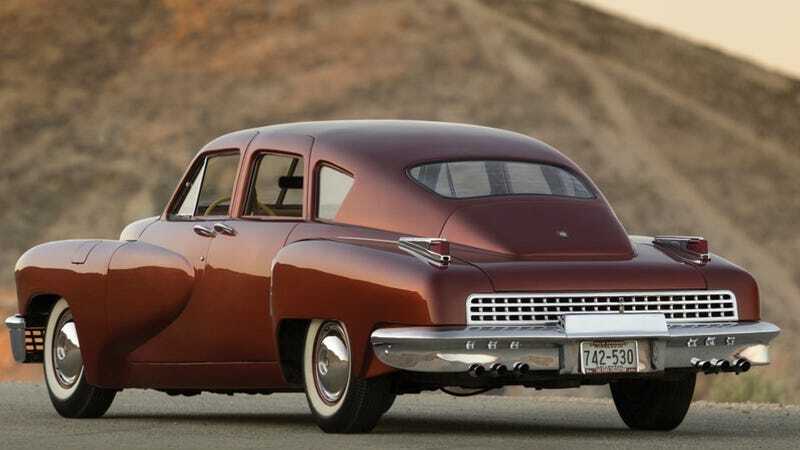 If you've got a coupe million dollars burning a hole in your APO jeans and a garage spot worthy of a classic piece of American underdog engineering, this lovely fiery bronze 1948 Tucker 48 at the big RM Auction in Monterey next month can be your latest prize. While someone will certainly pay too much for a Fiat Jolly or an old Firebird on a champagne-fueled lark, the person who shells out more than a million (one recently was bid up to $1.475 million but didn't meet the reserve, although that was owned by George Lucas) for this Tucker will go home with only one of 51 vehicles ever built, each one a prize, each one worth whatever it cost to buy. No word yet on the lineage of this particular model, but assume there's history enough to make it one of the pricier cars to go at auction this year.